It’s that time of year when you can feel the crispness of fall in the air! Beautiful colors start to fill the trees and cozy sweaters replace flip-flops for favorite wardrobe go-tos. In this edition, we want to shine a light on 40 exceptional years of service, explain how we are making our email more secure, let you know about a study looking into waiting lists for services across Ohio, highlight an entrepreneur who aims to inspire, and show a great new video from Summit DD’s Children’s Services that helps families understand what to expect from their Early Intervention services. Please share these stories and videos with your friends and family! School is almost back in session. We hope you and your family had a fun-filled summer full of memorable activities. We certainly did at Summit DD! In this newsletter, you’ll read about a new study conducted on the importance of inclusion in the work place, learn about a partnership with a new employer, and get the first glimpse of a beautiful new wall mural created by Dream Out Loud Studio artists. It’s hard to believe that we are halfway through the summer! 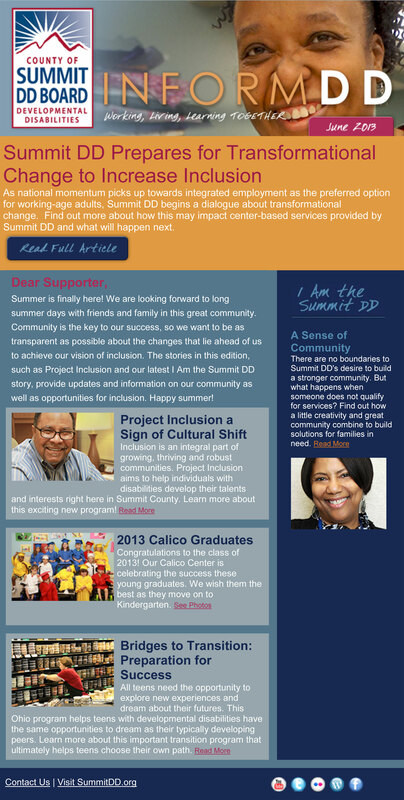 Although summer is usually know as a time to relax, Summit DD remains busy and focused on our mission. In this letter, we discuss more on inclusive communities, employment opportunities with a new partner, a new position designed especially to help 3-5 year old children, and an athlete with a heart of gold. Read on to learn more, and of course, please share this newsletter with family and friends!